If you want to make a weekend getaway or just enjoy a short trip, then you're in luck. 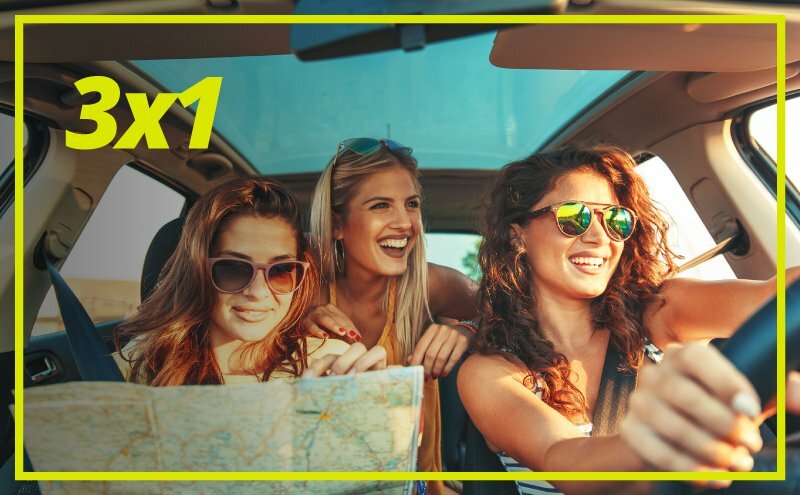 Take advantage of our 3X1 car rental deal by booking three days and paying the price of just one and save as much as you can during your holidays. Offer is only valid online and it is subject to availability. If you love to travel regularly and you're always looking for cheap trips, then now you can become part of our Goldcar Club. Remember that if you're a member of our club, you'll get a small welcome gift. Enjoy your holidays from the get-go. Don't forget that every car on the road must be covered by a mandatory insurance that at least covers third party damages. Goldcar's rates always include the mandatory car insurance. But that's not all, if you want full car coverage, the Super Relax coverage is available to you. This is an additional insurance that covers possible damages to other vehicles and includes 24 hour roadside assistance so you can forget about a deposit and there will be no need to block the deposit in your card.